Miami head coach Al Golden recruited a consensus top-10 class in 2014, and Saturday night at Sun Life Stadium, the youth demonstrated why the class was so highly rated. Future stars Braxton Berrios, Joe Yearby and Brad Kaaya led the Hurricanes (1-1) to a 41-7 victory over the Florida A&M Rattlers (0-2) and showed just how great the future looks for Hurricanes football. In his second career start, Kaaya played significantly better than on Sept. 1 at Louisville. He finished 12 of 22 for 177 yards with two touchdowns to Phillip Dorsett, including a beautiful 32-yard touchdown catch in the back of the end zone. Kaaya made a couple of rookie mistakes and threw two interceptions, but the true freshman made progress as the coaches expanded his playbook. Berrios was the favorite target of both Kaaya and Canes backup, Jake Heaps. Berrios, a small, sure-handed player a la Wes Welker, caught two big fourth down conversions, one from each quarterback. He finished with six catches for 63 yards. Yearby came off the bench to back up pre-season all-ACC tailback, Duke Johnson. Although both players are similar, it was almost like Johnson never left for the sidelines. Johnson came off after nine carries, 97 yards and a touchdown. He also passed Frank Gore for ninth in rushing yards in Miami history. Yearby came on and immediately made an impact, using his small frame and fast feet to squeeze through holes and cut quickly. He finished with 95 yards on 14 carries, proving himself to be a more than capable backup. “Today was his first go-around, his first taste of college and I think he has done well,” Johnson said of his protege. The Hurricanes’ defense pitched a shutout of the Rattlers, holding them to 114 total yards and forcing two turnovers. A&M’s only points came on a botched Miami punt that went for a touchdown after a high snap in the final minute of the second quarter. Rattlers quarterbacks Damien Fleming and Carson Royal combined to pass for 89 yards, and their trio of running backs was able to muster only 44 yards on 26 carries. Despite the score line, the game never felt out of hand until late. 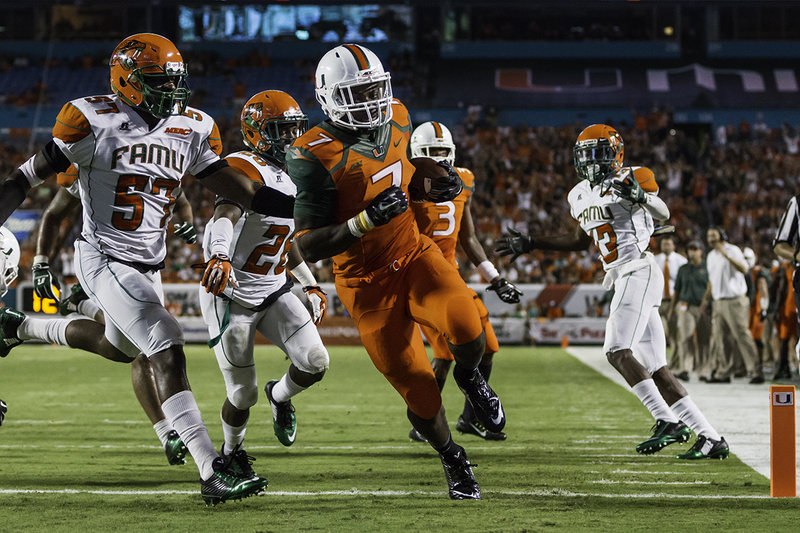 Miami jumped out to a 28-0 lead, but lagged in the final minutes of the second quarter and early in the third. Thanks in part to the great defensive effort, the Rattlers never got anything going, and the Hurricanes’ second team was able to clinch the blowout late in the fourth quarter. Watch for large doses of each Kaaya, Berrios and Yearby in next Saturday’s game against Arkansas State (1-1), as they’ll look to get more reps in before the huge matchup at Nebraska on Sept. 20. Saturday’s game was only the beginning of a journey for the young future stars of this team. Continuous contributions from the youth will be necessary as the Hurricanes start playing against harder competition. If the win against A&M was any indication, the future, and perhaps even this season, looks bright for Hurricane football.